"Woodlawn," a faith-based film that tells the true story of a 1970s Alabama high school football team that came to Jesus Christ during a time of racial injustice, exceeded expectations by raking in $4.1 million during its opening weekend. Produced by Hollywood power couple Roma Downey and Mark Burnett, the film stars Jon Voight, Caleb Castille and Sherri Shepherd. "Woodlawn" appears to have broad appeal among audiences, earning an A+ rating with Cinemascore, a market research firm that rates the viewing experiences of moviegoers. "Clearly 'Woodlawn' got this extraordinary rating because it's an A+ film," said Downey and Burnett in a statement shared with The Christian Post. 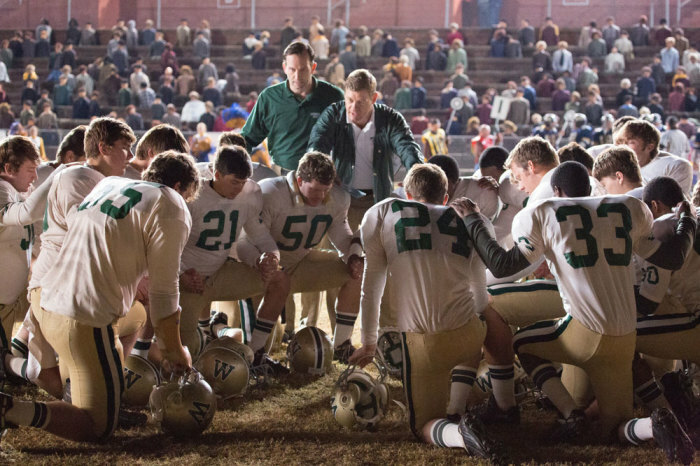 "'Woodlawn' takes the audience on a sweeping journey, which is both exciting and emotional. The Erwin brothers made an incredible film, and people are loving it. We are very encouraged." Jon Erwin, who directed the film with his brother, Andrew, also commented on the positive Cinemascore rating. "For me, as gratifying as the Cinemascore rating is, what's really touched me are the incredible ways audiences are engaging with the film," said Erwin. "Rival football teams are seeing it together and praying together. They are making the same decision for love and unity depicted in the film." Actor Kevin Downes, who also worked as a producer on "Woodlawn," believes the film will resonate with audiences because of its message of "One Way," and explained it to CP Voice earlier this month. "Woodlawn is a really special story that the Erwin brothers grew up with. Their dad actually is one of the key components in the film. [He is the] character Hank. He's a sports chaplain that ends up at this racially-torn, last-to-integrate high school in Birmingham, Alabama, and preaches a message that was just really timely that this team needed to hear," said Downes. "They were ready to hear it and made the decision to change because they were sick and tired of the fighting and hate, and they wanted to unify as a team and learn how to love each other. And all of a sudden they started winning football games. It led to the largest high school football game ever played in the history of Alabama. Over 42,000 people. It came together all in the name of one theme and that was 'One Way.' So they gave all the credit to God, whether win or lose, because there was only one way," added Downes. Football players from rival teams and different races unite under Jesus Christ, and Downes believes this is a positive example for the current generation that is struggling with racial injustices. "Woodlawn" is now playing in theaters nationwide.